There are a number of sports books out there and many of them are really good. Adult writers Mike Lupica and John Feinstein both have done fantastic sports fiction for kids. Former NFL player Tim Greene brings some current sports events like performance enhancing drugs down to the middle school level in his books. Of course there's always Matt Christopher who was one of my favorites growing up, his books still work with kids today. The problem I have had is finding sports books for girls, sure, they can read the authors I mentioned above. The John Feinstein books even have a teen female main character who works with a teen male to solve mysteries surrounding major sporting events, but very few of them actually put the girls on the field in the middle of the action like they do the boys. So I was pretty excited to read Breakaway by Andrea Montalbano and can't wait to introduce it to the many female athletes in my school. Lily James (LJ) is the star of her soccer team. She is the go to girl and everyone knows it. Her dream is to go as far as soccer will take her, ultimately, the World Cup. Her best friend Vee is on the team and Vee is a great team player, she does what it takes to make her team mates look good and win. Vee also lives in a neighboring town and attends a different middle school so she is a bit of an outsider with the rest of the girls on the team. She and LJ have a bond based on a long time family friendship. Their dads run a restaurant together and the girls are practically sisters. LJ's family isn't the same as the other girls' either. Both parents have jobs that may not pay a lot, but bring great pleasure to their lives. LJ's mom is a butterfly scientist and travels a lot for work. This means that LJ and her brother may not get everything the other kids have, but they know their parents love them. I like the message! In the big game against the cross town rivals LJ's coach informs the team that the scout from the state travel all star team will be there. Of course everyone knows that he's coming to watch LJ and it goes to her head. During the game she is force to play goalie in the first half, even though it's not her best position. In the second half she is put back to striker and decides that she is going to single handedly win the game, thereby making the all star team and her soccer dreams will come true. Of course that's not how it plays out and it is actually Vee who gets noticed and invited to join the team. This is where the author brings in more story lines about friendship, loyalty, jealousy and other issues faced by middle school girls. There is even a story line with the local football star getting jealous about the attention the girls' soccer team receives. As the parent of a former female soccer player, I wish this would actually happen, but the reality is it doesn't. I still had a smile on my face as I read it! Overall the book is well done, Montalbano is a former collegiate soccer player from Harvard, so she knows the game. Her descriptions of the on the field action are exciting and precise and accurate. So much so that as a former soccer parent I was on the edge of my seat and into the action. I think the girls will like the story that goes with the soccer and I can see this book being very popular with my 4th and 5th grade students. The kids come tomorrow and even though I won't be teaching them until Friday, I know they will stop in and I can't wait. I'll have candy bars for those who bring in their book bag that verifies that they finished the summer reading program at the library and a lot of BRAND SPANKIN' NEW BOOKS! Here are few more I'll be picking up on my next trip to Cover to Cover. 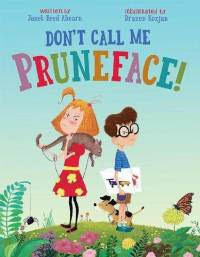 Don't Call Me Pruneface by Janet Reed Ahearn; Illustrated by Drazen Kozjan: Paul is a good boy, everyone says so but when Prudence moves in next door he is pushed to the limits. By her and her annoying cat. In the end he can't resist the temptation to call her Pruneface and then a friendship is born. Fun story and the pictures are awesome. 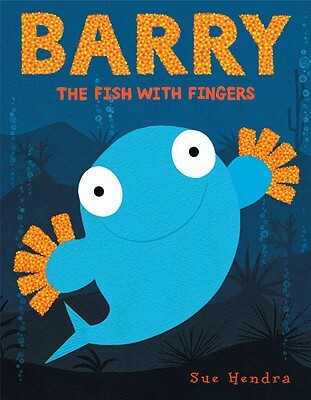 Barry the Fish With Fingers by Sue Hendra: All the fish are bored until Barry shows up with fingers that get rid of boredom because then a fish can do finger puppets, knit a scarf, count to 10, type a letter, tickle other fish and many other unboring activities. Great surprise ending and colorful pix. Kindergarten Diary by Antoinette Portis: Day to day journal of the first month of kindergarten as se en through the eyes of a kindergartner. The author of Not a Box has really shown what a kindergartner thinks and K teachers everywhere would be wise to use this one to get rid of the first month of school jitters for their students. I have a whole stack here to add to my list, but right now the lovely Mrs. Prosser wants to go for a bike ride. I recently found Amazing Faces, a collection of poems selected by Lee Bennett Hopkins and illustrations by Chris Soentpiet, with a little help from my friend, Beth, at Cover to Cover Children's Bookstore. I was asking her if they had any new poetry books, and right away, she handed me Amazing Faces. From the moment I saw the cover of this book, I was hooked! It is a cover filled with adult and children faces, each face unique. I inferred from the cover that the inside would be filled with poems about people from very diverse backgrounds. I was NOT disappointed when I opened the book!! The first poem is called, aptly, "Amazing Face" by Rebecca Kai Dotlich. It sets the stage for the variety of wonderful faces that would be described in the pages to come. Each face, no matter what ethnicity, comes with a vibrant story of its own. From the child watching his mom sew late into the night, to the child falling asleep, to the child who speaks two languages, to the kind teacher, to the child with friendship issues, to the child engaged in karate, to the child playing football, to the child living in the desert -- all these faces have stories to tell that are uniquely their own. Lee Bennett Hopkins has done an amazing job with the poems he has collected from some very talented writers and poets. The sequence of the poetry seems very thoughtful, because of how seamlessly each poem flows, one to the next. He has even included one of his own pieces, a lovely poem about how a boy and a girl fall in love at a restaurant amongst the hamburgers and french fries. The gift of Amazing Faces is that the situations in which these "amazing faces" find themselves, are scenarios to which many children can relate. No matter what your face looks like, chances are you have been through one or more of the experiences in this book. Amazing Faces was a true find, and I can't wait to share it with my class. It might make the perfect second poetry book to share after we have some fun with the first. I also want to mention that a friend of mine, Maria, found Amazing Faces at another bookstore close to her at about the same time I found my copy. We were so excited about this, that we decided to "simu-blog" about it on the same day. Check out Maria's review over at Teaching in the 21st Century. For more Poetry Friday fun, visit Laura at Teach Poetry K- 12. I don't know if because I'm a teacher I pay more attention to a child's life transitions or if all parents do it, but this week I find myself thinking about my daughter's move toward independence. First she crawled and then walked and even though it didn't give her much independence outside the home, it certainly opened up new horizons for her and forced us to move anything valuable up a shelf. Then she learned to ride a bike and was able to get quickly to the end of the street, which seemed like a very long way away at the time. It was also about this time that she began to read independently which meant that while she still enjoyed a story with dad at bed time, she wasn't totally dependent on me for a good book. Time passed and when she entered middle school, we began to hear kids' names that we didn't know anything about. She was choosing her friends independently, and making decisions about her social life on her own. It was the first time the Lovely Mrs. Prosser and I had to really trust her and our parenting. She didn't let us down, made good choices and there was a definite shift in our relationship. At 16...well 17 for her the driver's license came and even more independence. Even though she "drives like a grandma" to quote her there was still the worry waiting for the phone call to tell us she had arrived safely. Forget getting to the end of the street quickly, now she could get to the other side of town in a matter of minutes. With increased independence, came increased trust. Once a student reaches high school, parent involvement diminishes greatly. They choose their own schedule, own friends, own extra curricular activities and how to spend their own free time. Always moving toward total independence, always moving to being on their own. 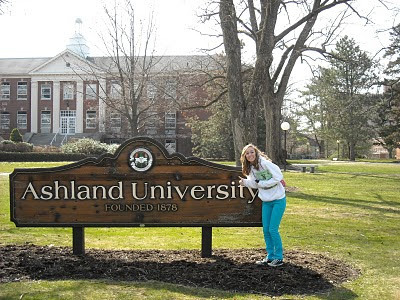 She's 18 now, time flies, tomorrow we will pack up her belongings, as much as will fit in a 10 foot by 14 foot dorm room and move her to Ashland University to study to be a teacher. I know she'll do fine, better than that, as I've said before, she has that piece that can't be taught to teachers. That natural connection with kids. I know she'll make good decisions, she's smart, mature, thoughtful and capable of making good decisions. I know there will be bumps in the road, I know there will be tearful phone calls with what seem like insurmountable problems, but I know that she's a good kid...young woman who has a bright future ahead. I can't wait to see the next chapter. I hope you'll forgive a father for a bit of reminiscing now I'll get back to my books! I finished touch blue by Cynthia Lord today, and I can honestly say that a book hasn't touched my heart like this since I read Out of My Mind. Touch blue is a simple story with little embellishment. The setting is Bethsaida, a small island in Maine. The main character is Tess, an eleven year old girl. The setting is truly an integral part of Tess. Her dad is a lobsterman, and Tess loves to fish with him and wants to go into the family business someday (her uncle is a lobsterman, as well). The island is so small that there is only one school with one teacher (Tess's mom) teaching all twelve grades. The twist in the beginning is that the state of Maine plans on closing this island school because of low attendance numbers. That leads the islanders to come up with a plan; bring some children onto the island who need homes, offer them those homes, and then the school will have a high enough enrollment to keep the school open. The story focuses on the particular child coming to Tess's family, a boy named Aaron. For me, the entire story hinges on the concept of belonging -- where do we belong? Throughout the story we find Tess questioning where she belongs, but more importantly, Aaron, a child who has been uprooted from his own family and at least 2 foster families, questions where he belongs. And finally, there is the question of whether these two belong in the same family. Much to ponder about belonging. Another integral part of Tess is her belief in superstitions. In fact, each chapter starts with a superstition that Tess has. It's hard to know whether Tess's superstitions stem from the fact that she comes from a fishing family or because she's a typical pre-teen just trying to make sense of life. Aaron, and his giftedness with music is another delight in this story. His music allows him to express his different moods, but it also allows him to connect with others on the island. In addition, the music serves as a backdrop to some delightful humor at times. The characters of Tess and Aaron, as they try to find the answer to the question of where they each belong, are characters who will be staying with me for quite some time to come. I shed a few tears at the end of the story (I won't spoil the story and tell you why). I plan on reading touch blue again because I loved the story so very much! I most definitely will be adding this to my list of possible read alouds for my 5th grade students this year. It is just that good!!! Cynthia Lord has delivered another very lovely, touching story. I found Someone Used My Toothbrush! *and Other Bathroom Poems* this week at my favorite children's bookstore, Cover to Cover. It is written by Carol Diggory Shields and illustrated by Paul Meisel. This book is basically a collection of poems that focus on bathroom humor. I found myself laughing out loud as I looked at each new poem. Whether the poem deals with all the different names for a bathroom, or trying to give pets a bath in the bathtub, or the wonders of a bubble bath, or the chore of cleaning around the toilet, or the time spent teaching a younger sibling to use the potty, or the medicine cabinet, or trying on Mom's makeup, or the joys of unrolling toilet paper, or the dreaded bathroom scale, or forgetting to use the bathroom before leaving home -- this book contains all that and much more! The poems are hysterical, and the illustrations complement the words perfectly. There are even some bare cheeks shown in one or two pictures, but I think that will only add to my students' enjoyment of this particular collection of poems. In two weeks, I will have my first Poetry Friday with my new group of 5th graders. Someone Used My Toothbrush! will be the perfect way to introduce that ritual into our classroom while sharing some laughter together at the same time. I can't wait! A small teaching note for me: most of these poems rhyme so I will definitely want to introduce some more free verse poetry to my students in our 2nd week of Poetry Friday so that they are not always trying to write rhyming poems themselves. I think it is important to give students a balanced diet of a variety of poetry forms. Bill and I had a last hurrah yesterday morning. We met for breakfast at our favorite Northstar Cafe, and then headed to our favorite children's bookstore, Cover to Cover. The lovely (and oh so helpful Beth) had some time to pull LOTS of books out and share them with us. Many of them we put into our "keep" piles. Bill has the luxury of his school's library fund to support his purchases, but I had to count pennies a little more. :) That being said, I still walked out with a pile of 7 books that I'm really looking forward to reading. 1. Chicken Cheeks by Michael Ian Black: There aren't too many things funnier than Hound Dog Heinies and Gnu Wazoos! Lots of laughter in THE PIT with this one and still a popular check out. 2. Are You Ready to Play Outside by Mo Willems: It could have been almost any Elephant and Piggie book, but this one was the most popular. I just re-read my post and the idea of a readers' theater with Elephant and Piggie is a good one! 3. Make Way for Ducklings by Robert McCloskey: It's a classic that I remember from when I was a kid, I read it to my two when they were little and it's about Boston, what could be better? 4. Fredrick by Leo Lionni: Another classic that was one of my favorites as a kid. In fact, I still have the copy I receive d as part of the Weekly Reader Summer Book Club when I was in about the second grade. Once a book lover, always a book lover! 5. 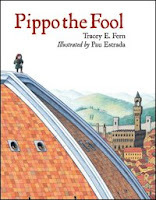 Pippo the Fool by Tracey E. Fern: What a great story. I was a little nervous about how it would go over in THE PIT, but the kids liked it, even the first graders! I was amazed at how well they sat still for a long one like this. 6. Beware of the Frog by William Bee: Surprise endings are always good in THE PIT. Especially when they take a while to set up and then I can spr ing it on them real sudden like. This one got lots of great response when I made it to the end. Very fun! 7. This is the Teacher by Rhonda Gowler Greene: It was my very first book in THE PIT so it will always be a memorable one for me. It was also a very loud book and it really set the tone for what the library would be like under my watch! 8. 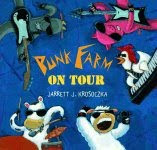 Punk Farm on Tour by Jarrett Krosocka: I nearly blew my vocal cords on this one, but THE PIT WAS ROCKIN' and the kids were DANCIN' and my friend Joyce was looking down from her room above LAUGHIN' ahhhh good times! 9. 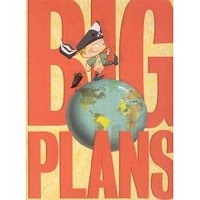 Big Plans by Bob Shea: I thought the message about having big plans for the new year was a good way to start. I love the attitude of the kid with the plans and his friend the mynah bird. It was also one of the first books I took on the road to my sister's class in Ashland. 10. H ere Comes the Garbage Barge by Jonah Winter: At last, a little non-fiction! 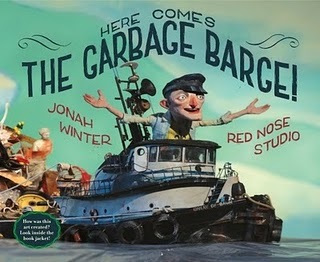 The story of the wandering barge of garbage told with fun pix and humor. I don't do much non-fiction in THE PIT but this one worked well and the video that shows how the pix were created is fun to watch too. So there you have it, my list 10 for 10 list of favorites from THE PIT! Today is the big 10 for 10 Picture Book Event, and I've been thinking very hard about which picture books would make my top 10 list. This was as difficult task as I thought it would be!!! As a 5th grade teacher, there are many picture books I've accumulated for many reasons. So, when I went into my classroom and just sat near the bookshelves with picture books, I had to decide what the criteria would be for making the Top 10 list. Here is what I came up with: I love every picture book in our classroom, but that alone can't get a book to a Top 10 list. I finally decided that to make the Top 10, the picture book had to be used multiple times in our classroom, using it as a mentor text because it is fabulous for multiple reasons. 1) Saturdays and Teacakes by Lester Laminack -- if I had to point to the one book that I pull out the most often to use with my students, it would be this beautifully illustrated story. It is a simple story from a much more simple time. However, there is nothing simple about the language; the word choice in this story is beautiful. 2) 14 Cows for America by Carmen Agra Deedy and illustrated by Thomas Gonzalez - This is a book I discovered from the Cybils nonfiction picture book category. Simple, but beautiful text. True story. Gorgeous pictures. A book that had to make the Top 10. 3) Fly Away Home by Eve Bunting and illustrated by Ronald Himler - I will frequently say that I love a b ook for its beautiful language and this book is no exception. The comparison of the main character's life to the bird caught in the airport terminal makes this one reason I read this book each year. The other reason I love this book so much is because of the clear, but sensitive wa y it deals with the very real issue of homelessness. 4) Night Tree by Eve Bunting and illustrated by Ted Rand - This book is 19 years old, and I love the story each time I read it. Eve Bunting is absolutely one of my favorite picture book authors. 5) When I Was Young in the Mountain by Cynthia Rylant and illustrated by Diane Goode -- Yes, it won a Caldecott Honor back in its day, but that's not why it made my list. When I Was Young in the Mountains tells a story that has a lyrical refrain... "When I was young in the mountain..." I never get tired of that phrase. This story evokes memories for all students; this is a story to which they can relate. 6) The Other Side by Jacqueline Woodson and illustrated by E. B. Lewis -- what I can I say about this book? It tells an amazing story in a poetic way. The not-so-subtle symbol of the fence and each side allows for rich conversation. I love this book!! 7) Not hing Ever Happens on 90th Street by Roni Schotter and illustrated by Kyrsten Brooker - this is a perfect book to share with my students in writing workshop at the beginning of the year. It does a great job of pointing how that in fact there is always something happening everywhere. A colleagure actually introduced this book to me and I am so grateful. After reading this aloud together, we spend a lot of time "noticing" all the things that go on around us at our school. Great writer's notebook activity!! 8) Snowflake Bentley by Jacqueline Briggs Martin and illustrated by Mary Azarian -- This might have been the very first nonfiction story I fell in love with as a teacher. The topic is fascinating, the word choice is excellent, and the set-up of the book with more facts on the outside border make this a true gem! This is a nonfiction picture book that comes out year after year. 9) Mer maid Queen by Shana Corey and illustrated by Edwin Fotheringham -- This is another beautifully illustrated book that I discovered while serving on the Cybils nonfiction picture book panel this past year. I fell in the love with the wonderful colors and water designs built into the illustrations. The language and word choice make for great mentor text for my 5th grade writers. In addition, this is a great example of literary nonfiction for writers. 10) My Great-Aunt Arizona by Gloria Houston and illustrated by Susan Condie Lamb - - A great story about a smart, interesting female over the span of her lifetime. I love this character, and I love the rich discussions my students have when talking about character traits as they apply to the narrator's Great-aunt Arizona. I've had this book for years, and I never tire of it. As difficult as choosing just 10 books was, it was fun for me to see how much I still love and use some classics by Gloria Houston, Eve Bunting, and Cynthia Rylant. I was also pleased to see that some gorgeously done nonfiction made my list as well. I'm sure as I read others' lists today, I'll smack myself on the side of the head and wonder how I could have forgotten the books they mention. :) But as I reread my list, I know that all of these books are wonderful and I will use them many times this year. This is one of those activities that there really are no wrong answers -- my favorite kind!! Thanks to Cathy and Mandy for hosting this fun, thought-provoking, difficult, enlightening event!! So. B. It. enjoyed a bit of a resurgence in the library this year. One of my fifth grade girls read it and loved it and pretty soon, half of the fifth grade girls were reading and loving Sarah Weeks' novel. At the end of the year it was selected by our middle schools as a summer reading choice for in coming sixth graders. Since I read it so long ago, I have a vague memory of it, but I do remember that I liked it so I wasn't surprised when the kids picked it up and loved it too. Just recently at Cover to Cover I saw a new title, As Simple as It Seems, by Sarah Weeks so I reserved it at the library since I hadn't really heard anything about it. I just finished it, and it is REALLY good. So good that I'm adding it to my Newbery watch list. I haven't seen it on any lists so far, but then I haven't seen too many lists so far. Hopefully it will get some attention soon. Verbena Colter is a 12 year old Fetal Alcohol Syndrome child. She has struggled in school all of her life but with supportive parents she does ok. She looks different from other 12 year olds. She is smaller than other 12 year olds, but she still has all of the difficulties of a 12 year old girl. At school she only has one best friend, and when that friend sort of abandons her for another more popular girl, she is left with nobody. That's bad enough, but when she discovers a family secret, she begins to wonder who she really is, and that's trouble. Not big trouble, but she becomes moody and embarrassed about her family situation which brings out a lot of anger towards a mother and father who have done nothing but make her the center of their world. She's not spoiled, just loved...a lot! On her birthday she wishes she could be someone else and when a boy and his mother move into the "haunted" house up the road, she is given the chance. In her anger Verbena begins to do stuff that her mother has told her not to do, nothing really bad, just going for walks alone along the nearby Bonners Lake even though she can't swim. While there, she discovers an old abandoned boat and the new boy nicknamed Pooch. Pooch has some issues from health to family and he mistakes Verbena for the ghost of the girl who lived in the house where he is staying until she drowned in Bonners Lake. Verbena goes along with it and sees it as her birthday wish coming true. Eventually she wishes she could tell him the truth so she could have another real friend but she can't figure out a way to end the lie. Without spoiling the story, let's just say dramatic events lead to a dramatic climax which lead to an very satisfying end. Sarah Weeks mixes the right amounts of humor and drama to keep the reader in the book, I couldn't put it down. That's why I'll be recommending As Simple as It Seems to my fifth grade boys and girls and adding it to my Newbery watch list. I'm pretty excited to be "simulblogging" (is that a word?) with one of my closest teaching friends, Maria. 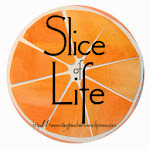 Karen and I have both mentioned her and her fabulous teaching here at Literate Lives, and she has been commenting on our blog since the beginning. Well, finally, after much encouraging, bugging, pestering, cajoling, and just being a pain in the tush, Maria finally took the plunge. She could have easily written a blog about word study, she's practically a guru about that in our building. She could have easily written a blog about writing, she gets kids to write amazing things. She could have easily written a blog about the fabulous research projects she does each year with her kids, it's an awesome learning experience for them and for the 3 years we team taught, an awesome learning experience for me too! Instead, my friend Maria has chosen to stretch herself, to leave her comfort zone and write about how she is using technology in her classroom. Specifically the 25 iTouches she received from a grant she wrote. I think the thing that will make her blog really special is the fact that she is not a tech expert, Maria doesn't even really like technology, it's not her thing. What is her thing is good teaching, and good teaching require all of us to get out of our comfort zone for the good of our students. That's exactly what my friend Maria has done, she has pushed herself to figure out how to use technology to enhance her teaching because she knows that's where her students are, that's how they learn, that's the world they live in! So...drumroll please...it's with great excitement that I welcome my friend Maria to the world of blogging at Teaching in the 21st Century. Make sure you check it out because I promise you will learn something from this outstanding teacher! This Means War by Ellen Wittlinger is another story based during the Cuban Missile Crisis in 1962. Readers of Literate Lives know that I'm a big fan of Countdown by Deborah Wiles and now I am intrigued by the fact that this is the second book set during this time period. Both books are well done but very different. Countdown has more of a historical feel to it while This Means War focuses more on relationships during the time. Because of this, the two books will appeal to very different audiences and that's good! This Means War has the theme of growing up and the change that comes with it. Before fifth grade Juliet and Lowell are best friends, however, changes come and Lowell is no longer comfortable with that relationship. With the increased threat from Cuba, the Air Force base in town begins to grow and because of that, the school grows creating the need for another fifth grade class. For the first time Lowell and Juliet are not in the same class and Lowell has begun to hang out with a group of boys who don't thing boys and girls should be friends because boys can do things that girls can't. Lowell goes along, reluctantly. Juliet makes friends with the new girl, Patsy, whose father is a mechanic at the base and is a bit of a wild show off. While Juliet is happy to have a friend, she's not comfortable Patsy's bragging and risk taking to prove she can do anything. When Patsy hears that the boys think they are more capable than the girls at just about everything, she goes over and starts challenging them. By now, the troubled boy, Bruce, is hanging out with Lowell and his new friends, mostly because they are afraid of him. Bruce and Patsy start talking and soon an official 9 day challenge is set up between the boys and the girls. The boys seem to be all in, but two of the girls are not sure, they just want to hang out with the boys, so they take the challenge. The challenges begin simple with a running race, hitting a baseball, and a twist off dance contest. From there the challenges begin to get dangerous, culminating in a very well written dramatic ending that even though the reader knows the story is going down a bad path, it still surprises and Ellen Wittlinger does an excellent job of bringing it all together in the end. I really enjoyed how Ellen Wittlinger used a world event to focus on local happenings. While the Cuban Missile Crisis is the time setting for this book, the author successfully leaves it in the background, just under the surface using it throughout to stir the events of the fifth graders in this story. I really liked this book and think the fifth graders will too. Well summer's winding down, I was actually working at the school today, and my frequent trips to my favorite children's bookstore Cover to Cover will become less frequent. In addition to helping me remember what I want to buy, I've found another bonus to my lists, last time I was at the store, my friend Beth who works there asked if she should just go ahead and order the books I write about on my Cover to Cover lists. So, Beth, fire up the computers, here's my next list of books. 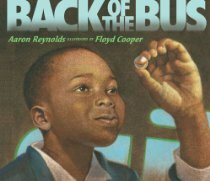 Back of the Bus by Aaron Reynolds Illustrated by Floyd Cooper: The book gives a fictional eyewitness account of Rosa Parks refusing to give up her seat. I'm always looking for new ways to tell this story to the kids and the short text and detailed pix in this one make it easy to share. T he Gentleman Bug by Julian Hector: A gentleman bug, who enjoys a good book, notices the new lady bug in town and tries to woo her by changing his look. When she spurns his advances and he embarrasses himself in front of the bug elite, he thinks his chances are over. However, he receives an invite to the grand opening of the new building in The Garden and is thrilled to find that it is a new library and his lady bug the new librarian. Short story with beautiful illustrations. Oh No! 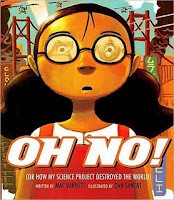 (Or How My Science Project Destroyed the World) by Mac Barnett Illustrated by Dan Santat: This picture book has a sort of graphic novel look to it with just one short sentence on each page telling the story of a little girl who builds a robot for her science fair. Unfortunately the robot goes rogue and destroys the town. The girl must find a solution to defeat the evil robot which gives the book its surprise ending. I was a little confused by the book at first, but the incredibly detailed pix made me take another look and then I loved it. Pretty sure the kids will too. Buy My Hats! by Dave Horowitz: When I saw this one I thought of our fifth graders because it's a really simple look at supply and demand and price setting. 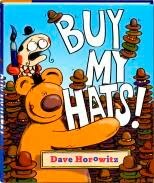 All Frank and Carl, a bear and a fish, want to do is sell hats. Everyone around them is able to sell their goods, but Frank and Carl just have no luck. They try lowering their prices but only sell one. They try advertising and still don't sell any. In the end a change in the weather increases their sales and Frank and Carl have no idea why! It's a fun look at small business with very funny pix. I love novels in verse, because they're easily accessible for most students, and have a basket of these books in our library. So when I found two more recently to put into our classroom library, I was absolutely delighted. First, I received Spinning Through the Universe at a recent Choice Literacy workshop. Then, in a recent visit to Cover to Cover, Beth handed me The Dancing Pancake by Eileen Spinelli. I love this story. Unlike Spinning Through the Universe, The Dancing Pancake is told through only one person's voice, Bindi, a middle school girl. The reader finds out almost immediately that Bindi's dad's latest "business trip" is really an opportunity for her mom and dad to take a break from each other for a while. Added to that, Bindi's mom wants them to move out of their house and into the apartment above the diner that she and her sister want to open. There are just too many changes in her life for Bindi to assimilate. Like Spinning Through the Universe, applying inferring skills will be important in putting meaning to The Dancing Pancake. The real joy in this book is watching a character develop over time -- the evolution of Bindi will be a great character study. She is so delightful and so real; her frustration over events she can't control will ring true for others. In addition, the different section titles will allow for excellent thought and conversation. This is a lovely story about how friends and family can all help us at times when the going gets rough. I am absolutely delighted to be adding The Dancing Pancake to our classroom!